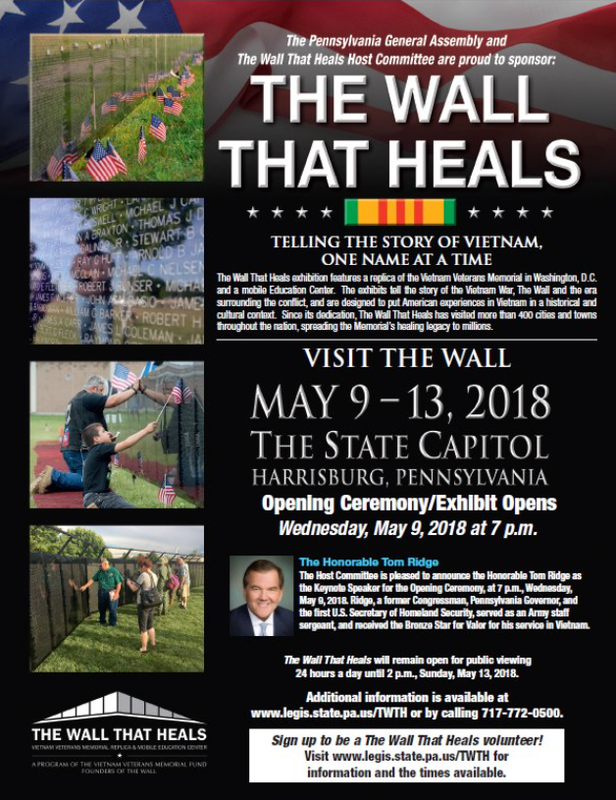 On Friday, May 11, I am hosting a bus trip for Veterans of the 34th Senatorial District to visit The Wall That Heals at the Capitol Building in Harrisburg. The Wall That Heals is a mobile replica of the Vietnam Memorial in Washington, D.C. and provides veterans the opportunity to reflect as they wish. We will arrive in Harrisburg at approximately 10 am and participants will have time on their own to visit The Wall, mobile Education Center, and have quiet reflection before going into the Capitol for a luncheon. We will plan to depart Harrisburg at 1 pm to return to the original pick-up locations. Please call my Bellefonte Office at 814-355-0477 no later than May 9th to make your reservation. In order to secure a seat on a bus, you must call to RSVP and, although at this time we are only able to accept reservations from Veterans, we will make necessary arrangements for special accommodations.